A rejuvenated Manny Pacquiao 59-7-2 (38) flew out from the Philippines today headed for Malaysia where he is confident that he will score one of the most important victories of his storied career. Waiting for him in Kuala Lumpur will be Argentine gunslinger Lucas “The Machine” Matthysse 39-4 (36) who will be staking his WBA “regular” welterweight title on the result of the fight at Axiata Arena this Sunday local time. 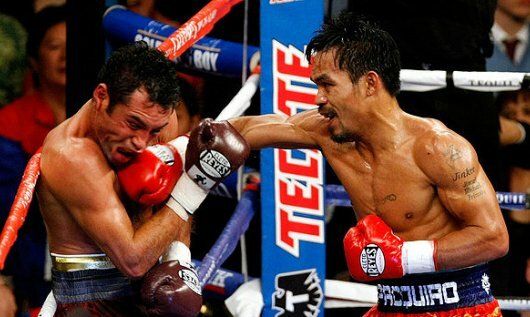 “We picked Matthysse because he has the guts and is a tough opponent, a busy fighter,” the Miami Herald quoted Pacquiao. “You can expect more action in the ring than the fighter I had before [against Jeff Horn]. The fight will be the eight-division, 11-time world champion’s first bout since being unceremoniously dethroned by Jeff Horn last July when he lost his WBO welterweight title to the unheralded Australian in front of 51,000 parochial fans at Brisbane’s Suncorp Stadium. This time around Pacquiao will be the default “home” fighter while Matthysse will be the one dealing with a hostile environment as well as a revitalised Pacquiao. “A victory over Pacquiao will be important for me, my career and for Argentina,” said Matthysse, who is has scored a pair of knockouts since moving up in weight after getting stopped in 10 by Victor Postol in his last fight at 140-pounds almost three years ago. Meanwhile Buboy Fernandez, Pacquiao’s lifelong friend and new head coach, has spoken glowingly of the 39-year-old’s preparation for this fight. “Manny prepared long and hard for this fight and he’s ready to prove he still belongs to that list of world champions,” Fernandez told the Manila Times. “Boxing fans all over the world will see a young Manny Pacquiao this time, throwing a lot of punches, more footwork, head movement and all he’s been showing before when he was acclaimed the best pound-for-pound fighter in the world,” added Pacquiao’s strength and conditioning coach Justin Fortune. Fernandez believes they have all their bases covered and says that their study of Matthysse as a fighter has been second-to-none. All the pressure is on Pacquiao now to do what few, if any, fighters can do: turn the clock back.